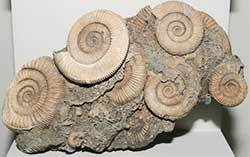 This Dactylioceras sp. fossil dates to the Early Jurassic period, 180-176 million years ago. 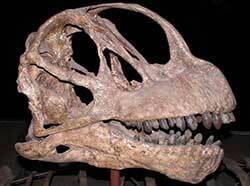 This Camarasaurus skull from Dinosaur National Monument dates to the Jurassic Period, about 150 million years ago. 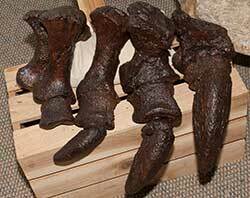 Apatosaurus Ajax Right Hind Foot - late Jurassic period, 150 million years ago. During the Jurassic period the continent Pangaea split into two major continents: Laurasia and Gondwana. This division opened up what would eventually become the Gulf of Mexico and the Atlantic Ocean. Underwater volcanic activity caused ocean floor to spread and thereby bringing about the rise of water levels. This caused much of today's known land to be covered by water and created shallow seas. As the tectonic shift took place, several rifts were formed and filled with water, forming, what would later become many of today's oceans and seas. These "oceans" were small and shallow giving way to an excellent, warm, tropical climate. Many coral reefs were formed and life, in general, thrived. The warmth and humidity affected the forest life and many large, thick forests began to appear. Some of the most common plants were large conifers and thick ferns. Dinosaurs continued as the dominant species and evolved to be gigantic. Many titanic sauropods became common including the Seismosaurus, and the Brachiosaurus. These were pursued by large predators like the Ceratosaurus, and the well-known Allosaurus. These large dinosaurs may have influenced the evolution of the first armored dinosaurs like the Stegosaurus. Mammals also remained small in order to remain safe in the ecological order of things. Pterosaurs dominated the skies and the shallow warm seas gave way to a thriving marine life including some of the largest marine predators of this earth's history, such as the Liopleurodon and the Temnodontosaurus. Near the end of the Jurassic period several species died out giving rise to the Cretaceous period. This transition was not as violent as the mass extinction at the beginning of the Jurassic period nor as devastation as what would come near the end of the Cretaceous. However, it led to another era and bid farewell to one of the most dynamic epochs of earth's history.